The strength and beauty of nails rely on the structural blueprint of the enhancement. Gel nails offer flexibility and toughness. They also offer the ultimate workability, giving the technician time to tweak and perfect the design before curing. So, whether you choose to sculpt on a form or use nail tips, putting some extra effort into the arch will end in splendid results. “My favorite technique for building a perfect arch is to drizzle the gel onto the nail at the apex,” says Tina Albanese-Stauffer, owner of Tina’s Natural Nails in Rochester, N.Y., and an NSI educator. “I dip my brush in the gel and pull up a string. When the string breaks I hold the brush above the apex of the nail. As I move my brush from east to west above the nail, the gel drizzles down building the arch.” She lets the gel settle slightly and locks it in place by curing for 20 seconds. “It’s so easy; just let the product do the work for you,” she says. Albanese-Stauffer points out that as your drizzle the product from above the nail, the brush never touches the nail. The gel lays right down and self-levels to fill and build up the apex. •	Practice picking up product. •	Get a feel for how much product you must pick up to create the string. •	Use tips to practice drizzling. •	“Lock” or “freeze” the effect by curing for 20 seconds before drizzling the next nail. Fully cure the whole hand once all arches have been built. “Establish a foundation layer of gel. Float in the body of the nail with the builder gel of your choice and turn the hand upside down,” says Greg Salo, president of Young Nails. “Gravity will do its job and pull the product into place.” Freeze the look before turning the hand over for a full cure. “You should always look at the side profile as well,” he advises. Stringing is the technique used to guide product from one area of the nail toward another. The brush is gently touched to the gel and pulled up and floated above the nail toward the area where it is needed. When the brush gently touches down to the gel again, the string ends. This is a great way to guide product away from the cuticle and bring it into the arch area. Build the Free Edge First? Talk to successful techs and competitors and you will find conflicting advice on whether to build the free edge or the nail bed area first. We tried it both ways and found the techniques worked equally well when practiced. It’s probably a lot like the difference between driving a car with an automatic transmission versus a stick shift. Once a driver gets accustomed to the feel, the ride is just as smooth either way. So go ahead and experiment a bit. Product manufacturers can help guide you to the techniques they have found work well for their formulations. •	Keep white on the extension area. •	Don’t drag pink onto the white extension. •	Use clear to fill in, build up, or correct “architectural” imperfections. Viscosity is the resistance of a material to flow. 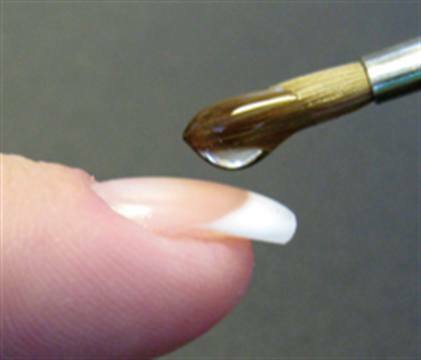 For instance, a low-viscosity gel will flow more readily. Jim McConnell, president and chemist for Light Elegance, notes: “When working with a medium-viscosity gel, there will be a moment when the gel has a perfect arch and C-curve. This usually occurs 10 seconds after the gel application.” Techs can “freeze” the shape at this time. Just remember to fully cure the nail once all of the arches are “locked” in place. • Work your gel with the brush high above the nail. • When working with a flat brush, keep one side free of product at all times. If you get product on both sides, you will lose control of the gel. “Techs need to learn how to work with the gel by layering to create the same results in shape and thickness as they do with acrylics. The arch should be the thickest section of the nail for strength,” points out Vicki Peters, vice president of Vicki Peters Signature Series for Kupa.